Let's start the New Year off with a bang, shall we? Duplicate protection is coming to Magic: The Gathering Arena with the January 17, 2019 game update! We know this has been a feature many of you have been asking for, and we're happy to announce that in a few short days, it will finally be here. For players, this process should be seamless—you'll either receive a rare or mythic rare you have less than four copies of, or you will receive Gems instead. Here's a breakdown of how it works depending on how you obtain your cards. For those of you who want to know more, we have a breakdown of the system below. But there are a few things we want to call out before that. First, rares and mythic rares are protected separately. This means if you've collected playsets of every mythic rare card in a set, you will receive Gems the next time you would receive a mythic rare—it will not "downgrade" to a rare (or vice versa). The Wildcard tracker and Wildcard pack drop rates will not be changing, and opening a booster pack still contributes toward the tracker, even when you receive Gems. Daily Quests and Weekly Win rewards will also remain the same with this update. One of the things we do need to change with the implementation of duplicate protection is the upgrade rate for individual card rewards (ICRs). You can read about those changes here. Finally, uncommons and commons will still contribute to your Vault progress, and the rewards from opening a Vault are unchanged—for now. We're still looking at implementing a system beyond how our Vault currently functions, but to ensure that duplication protection was available for the release of Ravnica Allegiance, the Vault will remain as a way for players to receive Wildcards from extra copies of commons and uncommons. If you open a rare or mythic rare card that you don't have four copies of, you receive the card. Easy enough. 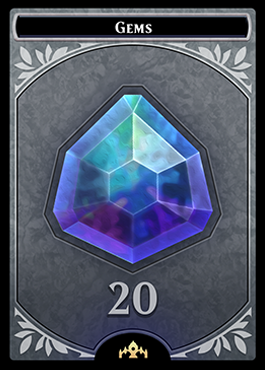 If you've collected all the rares and/or mythic rares in the set, the card will be replaced with Gems: 20 Gems for rares, 40 Gems for mythic rares. Duplicate protection is not applied when you open a 14-card pack in a Limited Event—you will still see and be able to pick any rare or mythic rare card, even if you already have four copies of it in your collection. Once you have finished with your Draft picks or opened your Sealed packs, the system will convert any extra copies you may have received. Rares/mythic rares will become Gems, and commons/uncommons will go toward the Vault. If you receive an uncommon ICR that's upgraded to a rare or mythic rare, and you already have four copies of the upgraded ICR, the card will be replaced with Gems: 20 Gems for rares, 40 Gems for mythic rares. If you receive an uncommon ICR and you already have four copies of it, the card will go toward the Vault. Okay, so, technically, this won't happen until the next preseason starts on January 31, but it's coming! We're planning to make a number of changes to Preseason 2 based on your feedback and the data you have provided, but the one thing we wanted to announce today is that we will be adding Constructed Best-of-Three to our list of ranked events once the new preseason starts. Other changes you should expect are adjustments to our matchmaking algorithms (specifically for Ranked Draft), as well as updates to the progression system for advancing Ranks. We'll have a full breakdown of what we learned during Preseason 1 and what changes are coming in Preseason 2 in a few weeks. By the way, we're also releasing a card set. Starting on January 17, Ravnica Allegiance will be available in Magic: The Gathering Arena. Ravnica Allegiance adds 273 new cards to MTG Arena and introduces five guilds on top of the five that came with Guilds of Ravnica: Azorius, Simic, Gruul, Rakdos, and Orzhov. Each new guild comes with a new keyword ability to the game, and with Ravnica Allegiance, all ten Ravnica guilds are now in-game (you can even hear each of their guild theme songs when you play their cards on the Ravnica battlefield). For those of you looking for ways to collect and play with these new cards, we'll have Ravnica Allegiance Sealed available on January 17, and on January 18, our Traditional Draft event will switch to Ravnica Allegiance. We'll also be holding a special Ravnica Constructed event on January 25, which will let you build and play with decks that only feature cards from Guilds of Ravnica and Ravnica Allegiance. Just after the kick-off Preseason 2, Ravnica Allegiance will be coming to Ranked Draft on February 1. Those of you who are participating in a Prerelease event at your local store will also find some MTG Arena content in your Prerelease pack: a unique code that you can redeem for one entry into a Magic: The Gathering Arena Ravnica Allegiance Traditional Draft event. The fine print: Code expires July 1, 2021. Limit 1 per account. MTG Arena (and its game codes) are not available in all regions and languages. Account registration required. Prerelease space is limited; contact your WPN member store for details. 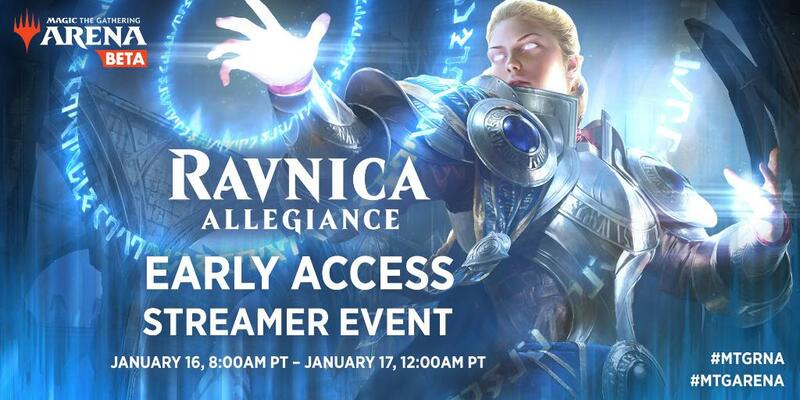 And if you would like a sneak peek of Ravnica Allegiance and all the other changes coming in the January update, be sure to tune into our Early Access Streamer Event, featuring hundreds of your favorite content creators from across the globe. The event kicks off January 16 at 8 a.m. PT (16:00 UTC) over on twitch.tv/magic. And, as with every update, there will also be a variety of bug fixes and quality-of-life improvements beyond these big-ticket items. Full release notes will be available once the January update is live this Thursday, so be sure to keep an eye on our Status Page for the latest information on maintenance times—and when the update will be live and available for you to play!